When Chennai's northernmost suburb is connected to the IT hub in the south in Phase 2 of metro rail, commuters will have eight interchange stations where they can shift between corridors to reach their destinations, including Central and Egmore railway stations and the airport. The eight stations will allow commuters to traverse more than 91 km across two corridors. 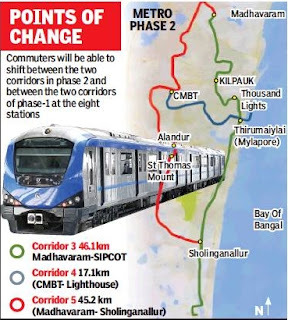 Chennai Metro Rail Ltd officials said Madhavaram, Sholinganallur, Kilpauk, Thousand Lights, Mylapore, CMBT, Alandur and St Thomas Mount will be interchange stations where the two lines of Phase 2 intersect. Commuters will be able to shift between the two corridors in Phase 2 and the two corridors of Phase 1 in these stations. People from Madhavaram will be able to alight at CMBT and get to the bus terminus or shift from the Phase 2 to the Phase 1 corridor to take a train to Egmore or Central or board a direct train to the airport. Commuters from Sipcot in Siruseri in the south will be able to alight at Alandur and shift to the Phase 1 corridor to get to the airport, CMBT or Central. CMRL will first take up two of Phase 2’s three corridors — Madhavaram to Sipcot (46.1 km) and Madhavaram to Sholinganallur (45.2 km). 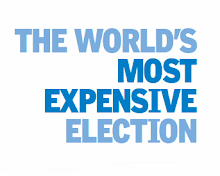 It will start on a fourth corridor only after a final decision on its extension. 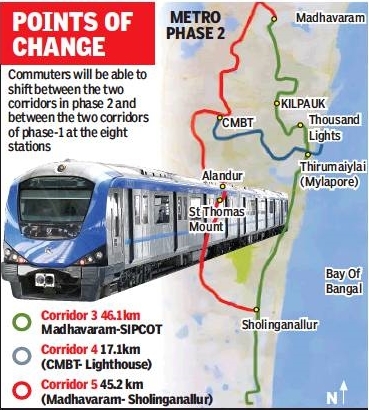 The three corridors will connect at four stations: Madhavaram, Sholinganallur, CMBT and Thirumaiylai (Mylapore). The fourth corridor, between CMBT and the lighthouse (17.1 km), is to extend up to Poonamallee. CMRL will soon have a detailed project report prepared. There are stations in five localities, Kilpauk, Thousand Lights, CMBT, Alandur and St Thomas Mount. In Phase 2, CMRL will build facilities at these stations for commuters to easily move between corridors of the two phases. In Phase 1, Alandur serves as an elevated interchange station and Central as an underground hub that connects the two corridors.